Kale is getting a lot of press and finding its way on all the top blogs. I had to ask this kale to stop on the red carpet to photograph it. Why is it growing in popularity? Probably because it is THE answer to the healthy eating question: How do I get lots of nutrients for few calories? I used to HATE kale. Seriously, I am not kidding you. I hated the stuff and now I am eating it and I LOVE it. How did we fall in love? Well, I made kale chips. And, now, I am going to convince you to make kale chips. These are the best replacement for potato chips that you can find. They are satisfying, a little salty, crunchy - yum! They go well with not-so-nutritious beer. How do you make them? First, you spend all of $2 on a bunch of fresh kale. Then you RIPPPPP the leaves off the stems and toss them into a bowl with some olive oil and salt. And bake for FIVE minutes. Viola! Kale chips! Yes, you can do this and when you taste them - you will be eating one of the healthiest vegetables you can eat. Toss out your multi-vitamin and wrap your gums around these chips. I have tried to make these chips without the olive oil and it was not good. Something about the fat in the olive oil brings out the sweeter flavor in the kale. I think that when you are eating something as healthy as kale - you don't need to worry too much about adding a little fat. 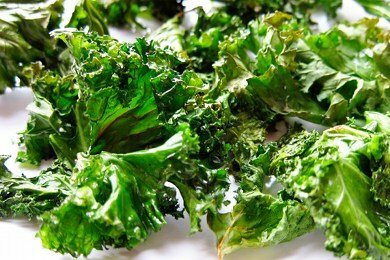 Do you make kale chips? Share your love (or hate) of kale below. Heat oven to 500 F. Line rimmed cookie sheets with parchment paper or aluminum foil. Tear the leaves off the thick stems into chip sized pieces. An easy way to do this is to fold the leaf in half and just rip toward the stem. Put in bowl and drizzle with olive oil and sprinkle salt to taste. Bake 5 minutes or until edges are brown and kale is crispy when moved in pan. The idea here is to make clean up easy (just toss the paper and then you have less work to do). These are really very tasty chips. I am reading about this for the first time but it is very yummy & can be cooked easily. Nice sharing. Thanks. 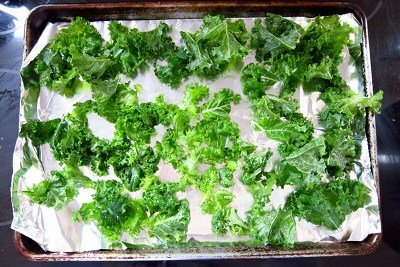 My wife and I regularly make kale chips sans oil and while we have to keep a close eye on them while baking (since the difference between perfect and burned is about 2.7 seconds), they're delicious like that, too. Please keep the kale ideas coming, Lisa. I think that http://www.snack-girl.com/snack/kale-chips/ clued me in to the idea of eating it and I'm so glad I tried it. Thank you! So, as a tiny tot, if something bitter touches your tongue, it's not unreasonable for your tiny brain to raise a red flag, saying, "Uh oh! Bitter = Bad!" and you spit it out, possibly saving your tiny life. While that "bitter test" undoubtedly works well for a tiny body that needs the best "raw materials" in order to grow up big and strong, as we age, we can afford to be less sensitive to the result of a "bitter test" because not all bitter tastes = poison. But -- while we're young -- better safe than sorry. Again, the above is just some wacky idea I had in an attempt to explain why we hate bitter stuff as kids, but -- for those who are willing to try again later in life -- not so much as adults. Great recipe Snack Girl! Just one question- what's the time equivalency if my oven can't go above 450? These are even healthier if you use a dehydrator! Frankly, I don't feel the love. I was really excited about trying this when they became "in" a few months ago. To me, kale chips just aren't that satisfying. They just dissolve into nothing but salt in your mouth. I'll have to stick to the green smoothie for my kale consumptions, I guess. KALE CHIPS?? Thank you! I know all about the meteoric rise to stardom that kale has taken lately, and my girlfriend is all over it. She served me a kale salad which I did like, but wondered how I was going to get this into my diet b/c I am not a natural fan. These intrigue me, though, and my just be my ticket! Just had some last night! One of the local farmers at our farmers' market recommend I just pile them on, not worry about spreading them out, and toss once, this is easier for me, and the kids LOVE them! My 3 year old couldn't eat enough of them last night while we watched a film - how's that for a substitute to sugary movie treats? I am like the commenter above, I was so excited to try this because I never heard anyone say they didn't like them. Well, I did not. I don't know what it was, but it just was not good. I am glad though that you can't taste them in a smoothie!! I make my Kale chips with Kernel Seasons Barbecue Popcorn Seasoning and olive oil! Makes them even sweeter that way! I love that I can eat a HUGE bowl and not feel guilty! Sounds so yummy and healthy. I need to try this. Will have to try these! Thanks, Snack Girl!! As gardening time comes near, I would like to plug kale as one of the best producers in the garden, per square inch. And our grandchildren eat it right off the plant as it is growing. I've tried and tried, but I just can't get into kale chips. It's stinky because there healthy. Maybe I'll give them one more try? Um, I wouldn't eat anything that you buy at the store without washing it first! Wash and dry thoroughly! Jennifer, try adding different seasonings. EVOO and salt is nice, but can be a little plain. I like to dress mine up with garlic powder, pepper, cayanne, etc. You could even throw on some parmasean cheese as soon as they come out of the oven. I've made kale chips but I came out with half-soggy, half-burnt chips. Any suggestions on perfecting them?? ?